Grace is a concept that I have really struggled to explain to my kids. It often comes up when we’re talking about forgiveness and what Jesus has done for us, but that’s so abstract for little minds to take in. This past week, we had the perfect object lesson for grace. We were at Walmart… Doesn’t every good story begin that way? I rarely take all three of my children to the store with me, except during the dreaded grocery trips of summer. But sometimes, circumstances necessitate an after school trip with all three of the babes. Sophie’s new glasses coming in after nearly two weeks of all the other pairs being lost (the third pair since December, friends, Arg! ), was the extenuating circumstance that led us all to the store together after school last week. And I also needed paper clips. Of course. So we couldn’t just go into the vision center at Walmart and then sneak right back out. We had to actually travel into the store itself. As we passed through a check out lane in reverse, heading into the store, Sophie spied the Easter candy and swiped a bag of peanut butter eggs. 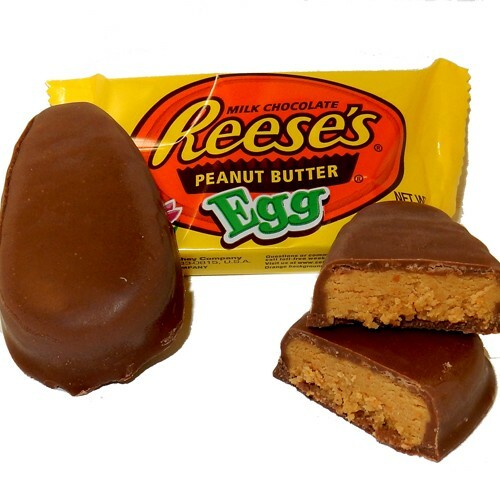 Now folks, I really love peanut butter eggs. There’s no comparison, in my book, of any other candy that comes close to the peanut butter egg. So I consented that they could get the eggs, IFFFFFFF they would behave in the store. All three of them threw fits and cried at one point during our brief (BRIEF!!!) trip, over some sort of nonsense. I scolded them and threatened them about losing their eggs, even told them that they weren’t going to get an egg when we got home. But I’ll be darned if I wasn’t going to get one after my bravery in taking ALL THREE CHILDREN to WALMART. So we bought the eggs. Most definitely. Blank stares in my direction. Confused faces. Shakes of the heads. Finally, the lightbulb went on! That is GRACE! That, my friends, is grace. It’s getting the peanut butter egg of life, even when we’ve been a rotten monster. It’s receiving Jesus’ love and accepting his gift of life even when we least deserve it. So go ahead and enjoy that delicious life that Jesus has offered you. Don’t let the enemy convince you that you shouldn’t have it because you don’t deserve it. That’s exactly what makes grace so magnificent — you don’t deserve it. And yet it is offered to you, full and free and wonderful, because He loves you! I LOVE this, Catherine! What a great object lesson! You’re such a smart mommy! Thanks for giving this mom new ideas on how to teach about grace. Love this and thanks for sharing!